Inside Palo Alto's newly renovated Downtown Library recently, Cornelia van Aken rattled off a list of new programs the staff is planning for kids and adults: weekly family movie nights; technology "petting zoos"; a workshop on knitting scarves as holiday presents; a "Harry Potter" Fest. The assistant library director could be forgiven if her voice was tinged with a certain "Field of Dreams" optimism. After 14 months and $3.2 million, the Downtown branch is re-opening July 16 with a host of new features, chief among them a community meeting room that can hold up to 60 people. Much like Kevin Costner's character in the 1989 movie about a magical ballpark, van Aken envisions a raft of possibilities for the Forest Avenue branch. "We never had the opportunity to provide programming before. There simply wasn't the space," she said of the 9,046-square-foot library. "Now we have a fantastic community room." Though overlooked by some residents -- the larger Main and Mitchell Park libraries attract far more patrons and more of the city's resources -- the Downtown branch has become symbolic of Palo Alto's effort to hit the restart button on its library system. It is the first of three branches, along with Main and Mitchell Park, whose renovations are funded by Measure N, a $76 million bond passed by voters in November 2008. Measure N's approval was regarded as a significant milestone for the five-branch library system, putting to rest a contentious, decades-long debate about consolidating the branches into one central facility. The city is hailing the re-opening as "the auspicious start of a city-wide effort to bring state-of-the-art library facilities to Palo Alto citizens." But even with the fanfare and optimism, librarians and library supporters are the first to admit that where libraries are headed is anybody's guess. "It's a crystal ball that nobody can read more than two or three years out," said Bern Beecham, former Palo Alto mayor and president of the Palo Alto Library Foundation, a nonprofit fundraising group. Libraries across the country are facing changing tides, as demand for digital resources such as e-books and databases -- even, simply, for Internet access -- has grown. More Americans are making greater use of their public libraries, according to a 2009 American Library Association survey, with the number of average in-person visits up, along with circulation of materials. "Public libraries throughout the country are really looking at who they are and what services they need to provide," Library Director Monique le Conge said in an interview with the Weekly. "I think of the library as sort of the community's living room. It's the place where you can do homework, be entertained, read for fun, have a quiet space to relax, interact with your friends and family. Many libraries are adopting that model where its spaces are flexible (and) there are different kinds of seating for different needs, different kinds of tables, different technology." National trends reflect that notion of the library as a community space. The American Library Association survey showed that, in addition to borrowing materials, 35 percent of library patrons rank entertainment as a top reason to visit the library. Educational purposes -- such as a place to do homework or take a class -- also ranked high, with 28 percent of people using libraries for that reason. The Milpitas Public Library, a 60,000-square-foot facility, opened in January 2009 with private reading rooms, group-study rooms, a computer-training center, a conference room with a large flat-screen television, and a 200-person-capacity multipurpose room/theater with a stage, where book sales and live concerts are held. At a fraction of that size, Palo Alto's renovated Downtown Library was nonetheless proposed in a 2009 city report as a place that should combine the characteristics of "(a) a traditional library with large physical collection, (b) modern bookstore and (c) neighborhood coffee shop." When it re-opens in a week, the branch will have its own group-study room with an electronic Smart Board system; the ability to broadcast meetings from the 1,150-square-foot community room; fiber-optic Internet connection for 12 public computers and eight laptops; and improved library-wide Wi-Fi access, so anyone with a laptop, tablet or other mobile device can drop in and easily surf the Web. Even as libraries have started morphing into technology-outfitted gathering spots, some have wondered if the rise of e-books will mean the decline of the value put on print. In Palo Alto, that debate heated up last November, when plans for the renovation of the Main Library showed that its collection of physical books would actually shrink. The Downtown branch will have about 19,000 items, including books, DVDs and CDs, on re-opening day. That's more than it held in 2010, when the collection totaled about 11,200 volumes, according to the city. Over time, the collection is expected to grow to 21,572 items, le Conge said. And yet, that figure is much lower than the 35,000 that neighbors of the library lobbied for in 2009, gathering a petition with 500 signatures, according to Palo Alto resident Jeff Levinsky. The advocates said a larger collection of books was promised to Measure N voters. Levinsky, former president of the Friends of the Palo Alto Library, a fundraising nonprofit, has measured Downtown's collection against those of 17 comparable library branches in California. "When you look at them, (Downtown's) collection per capita is tied for last place," he said. "It's a concern." But le Conge said the library's collection of physical books will be maintained at capacity. While the rise of interest in e-books "is definitely a trend we need to pay attention to," both e-books and physical books will be part of the library system, she said. 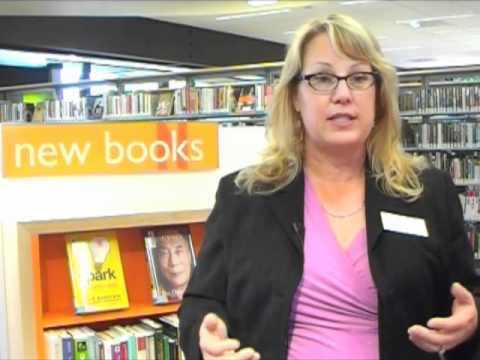 In the 2010 fiscal year, e-books and e-music accounted for just 0.5 percent of the Palo Alto library system's collection. But interest is growing, le Conge said. In the five weeks since she started working for the city, the most frequent comments she's heard have been about e-books and the need to have more available for library users, she said. A library-space consultant hired by the city estimated in March 2010 that e-books could account for 5 to 10 percent of the new Mitchell Park Library's holdings. Beecham agreed e-books will play a growing role in public libraries, citing a study showing that 12 percent of American homes have e-book readers. "It's where people are going. And the library has to adapt," he said. "If we fail to keep the people who want to read electronically, who want to read their e-books ... then we lose both a lot of the benefit one would get from a library. "So we've got to have the programs and the resources and the capabilities people want us to have as we go into the future," he said. That the 40-year-old Downtown branch is re-opening at all is a minor miracle. For decades, it has been one of the most embattled branches in Palo Alto. As city staff has bandied about the idea of consolidating the library system, Downtown has repeatedly been identified for closure, a reduced collection or shorter hours. In 2004, then-Library Director Paula Simpson recommended establishing a single, full-service library at either Mitchell Park or Main, while turning the College Terrace and Downtown branches into facilities for other community services. The City Council rejected the controversial proposal, and in 2006 and 2007, council members made library improvements one of their top priorities of the year, which eventually led to Measure N in 2008. The bond's passage ensured that the Downtown branch would survive for the foreseeable future. And so it opens its doors again. Three separate staff areas have been consolidated into one administrative office, allowing for an open central space. The dimly lit interior has given way to bright overhead lights and even a rainbow of LED lights embedded in an oval above the computer stations, with the tiny pinks, greens and purples cheerfully pulsating in patterns along the ceiling. The branch's square angles have been softened with curved ceiling treatments, and the traditional shelving has been augmented with orange-and-blonde-wood "gondolas" -- short, movable units that will enable librarians to reconfigure space as needed. The community room has retractable walls so the space can become a reading area when not in use. And the collection of books that was criticized by some in the neighborhood as small and outdated is refreshed, according to van Aken, with old volumes replaced by updated ones. To aid in the task, the Friends of the Palo Alto Library recently gave funds to "enhance" the Downtown collection. In spite of all the changes, the "Field of Dreams" question persists: Now that the city's renovated it, will they come? The Downtown Library has always attracted the most eclectic mix of patrons of the five city branches, according to librarians -- from unhoused men and women who use the computers to future billionaires employed by nearby startups to older adults who live in downtown condos. "It's a microcosm of what Palo Alto is," Library Specialist Dave Sigua said recently, gesturing to City Hall and downtown on one side of the branch and the University South and Professorville neighborhoods on the other. But missing from that mix have been the young families who live in the area and the teenagers who go to Palo Alto High. To see if the library can draw in those groups -- along with more of the tech-savvy singles employed downtown -- the librarians are planning outreach with programming, books, technology and new space. A cheerful children's room has been added, complete with its own computer station amid the green and blue M&M-shaped cushions, magnetic walls for displaying kids' artwork and shelves of books on dinosaurs, space ships and other topics. Before, the kids' area "was, like, a shelf at the end," Sigua said, only half-joking. Van Aken envisions baby storytimes in the community room, with 60 babies at a time being entertained by staff. To draw in teens, the library has added a young adults' books collection. And librarians expect to host a "Breaking Dawn" party in November to celebrate the most recent film adaptation of the Twilight book series. As for the young entrepreneurs? Van Aken has already considered one idea: a 20s-30s singles' book club. Those in the community who have battled to save the branch are glad to see it re-open. Jim Schmidt, president of the Friends of the Palo Alto Library, which has donated $2 million to the library system over the past 10 years, was one of those who fought to keep the branch alive. "My wife and I are big fans of the downtown library," he said. "It's a continuation of tradition that goes back to 1903. ... We're glad to have the 100-plus-year tradition renewed. "It's functionally and aesthetically pleasing," Schmidt said. Le Conge knows that adjustments will be necessary to ensure that the library provides what the public is looking for. She said she welcomes feedback from the community through the library's online suggestion form and in person. "As we continue to go forward, libraries will find ways to proactively respond or be just-in-time with all of the services that the community needs. More and more we'll be asking all of the people in Palo Alto: 'What do you want from us? What do you want to see? Are there certain collections you think we need more of? Are there programs you would like us to offer?' And we'll find ways to respond to the trends and the ideas we hear about in the community," she said. While not dismissing past debates over Downtown, le Conge hailed the results of the renovation project. "The Downtown Library is a beautiful example of how the needs of the community were incorporated with all of the community's needs in mind, whether it was for books, technology, programs, or a welcoming space for learning and entertainment. We will continue to use best practices so that we offer the most pro-active on-time services we possibly can," she said. How does charging $45 an HOUR for use of the community room every evening and 3 days a week fit with the desire to have the community use the building? Four million dollars of remodeling and they couldn't figure out how to seal off the meeting room from the library during off hours? Alas, the elegance of the library is gone, it looks more like a trendy coffee-shop-nursery-school now. What a waste of money. With a beautiful Children's Library, we are duplicating services by adding "programming" for babies? It is unfortunate that the Downtown "special interest" group was able to avert Paula Simpson's logical, fiscally responsible suggestion of one Main Library with community spaces throughout PA. I have two dates down for the opening day - July 10 and July 16. >Four million dollars of remodeling and they couldn't figure out how to seal off the meeting room from the library during off hours? Was Group 4 told not to put in a gate or something like it, that would do the job and make the meeting room useful to the public? Another example of misguided priorities. City officials cry fiscal emergency, but yet they supported the drive to approve a multi-million dollar library improvement initiative. The downtown library was already under-utilized and had essentially become a haven for our homeless population. And at what expense. Cuts in public safety and more discussion on closing fire stations. How about closing one or two libraries? Unreal. Libraries are massively expensive to operate, with the costs growing every year, The Downtown Library Branch is an example of a poorly utilized facility that will most likely continue to be poorly utilized, as the world shifts to e-books. California is spending between $1.4B and $1.5B in public libraries, and another, greater amount, in the public school system. The total cost is probably over $4B a year--for Brick-n-Mortar facilities that are closed most of the time. California can no longer afford this misuse of public funds. Other than the Children's Library perhaps, which has a rich history, the Palo Alto library system should have been scaled down to just one. Libraries have certainly evolved to maintain some relevancy, but for the most part their time has passed. Outdated, under-utilized, and non-essential. One main library could certainly serve the entire city. Our civic leaders pushed for the multi-million library improvement project, on the heels of heralding a fiscal emergency. Never mind the other million dollar projects they recently approved for park and playground improvements. Unbelievable. All at the expense of having to make cuts in public safety and possibly shutting down fire stations. I look forward to having our library re-open. I'm very excited to see this library re-open! It's a wonderful location in the heart of the city. I can't make the grand opening on the 16th, but I'll be in sometime that week to check out the new space. I think adding children's programming is a great idea. There are a lot of families walking distance from this location that will certainly take advantage of the new offerings. Thanks for the well-researched and data supported papers. So this remodeling was $3.2 million. What is the other $72 million from the bond issue going to be spent on? Buy every single Palo Alto resident a Kindle. Use $7.2 million to negotiate limited book viewing rights with the publishers and authors. Return remaining $60 million dollars to taxpayers. Now every citizen has access to every page in the library of congress from their home. Check out the salary of the Library Director! Do we really need to pay her that much? A friend from Seattle emailed us the following link on Library of the Year 2011: King County Library System, WA | The People's Library. One of the keys to their success is management and leadership. The web page also lists the name of the director of each winning library. It says a lot.